There are plenty of Egyptian themed slots and with good reason – very few eras in history have captivated our imaginations so vividly. I've been to Egypt a few times and leave in wonder and awe each time. The shop that touted to have” everything between A to G” because that's where the owner thought our alphabet ended. Tour Guides that, with a few words and a slip of a some Egyptian pounds, bypass queues of thousands. Apart from nostalgia, this slot has an undeniable romantic appeal. I know that sounds sappy, but it's true! Legend of the Nile has a very distinct setup of 6 reels and instead of paylines has cluster pays. Instead of spinning, the reels symbols fall down and occasionally form winning clusters of 4 or more symbols. All the winning symbols then explode and new symbols drop in their place. A variety of Egyptian artifacts are the symbols, with the Pyramid being the wild which can replace all items except the bonus symbols of Isis, Ra, and Anubis. Don't be intimidated by the layout; it's pretty easy to use once you get the hang of it. Along the bottom are Game Settings (including Turbospin), Choose Coin, Bet Level, Win amount, Max Bet, Spin, Double Up (gamble) and Autoplay (with the Paytable Info above). There is a Double up (Gamble) option offered after each winning spin in standard play. You can either bet your entire profit or half on the toss of a coin. 8 symbols = 8 Free Spins. 9 symbols = 10 Free Spins. 12 symbols = 12 Free Spins. 15 symbols =15 Free Spins. 17 symbols =x400 total bet. 20 symbols = Progressive Jackpot. 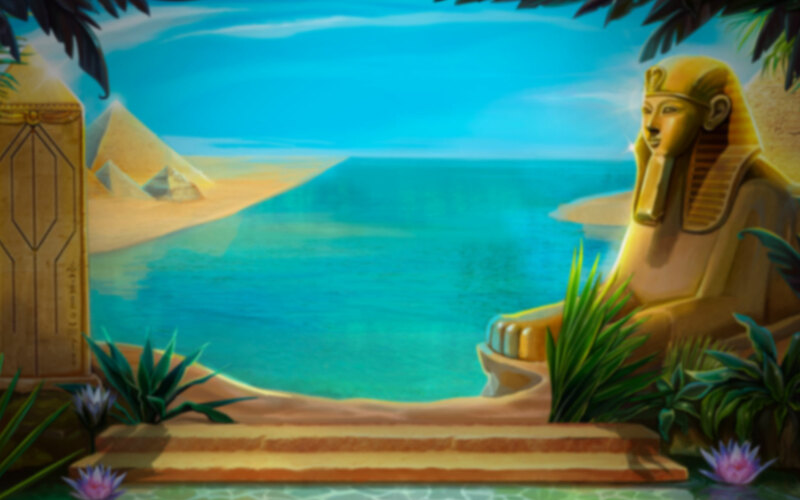 Isis & Anubis Trails – Every winning corresponding cluster advances its trail a step, together with increasing the stake amount for Free Spins. When the trail is complete, 10 Free Spins are triggered at the cumulated amount and that trail is reset. A lot is going on in this slot, but it doesn't miss a beat in the performance department. The graphics and animation are excellent for this theme. The music is evocative and the sounds effects fit in nicely. Certainly one of the most feature-laden slots out there. Legend of the Nile kept me engaged for hours (about 30 minutes longer than my second fiancé). It keeps your attention and stands out from its many counterparts (what she said I was unable to do!). I thoroughly enjoyed my virtual cruise down the Nile and I'm pretty sure you will too!